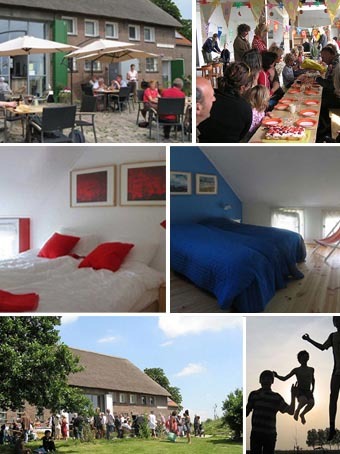 Nature island Suzanne Hoeve farm building converted to renovation to energy efficient ‘Hostel’ hotel with multifunctional space, professional kitchen, six bedrooms with individual en-suites, camping kitchen, shower/toilet room and private house 488m², Tiengemeten. Room to build in Holland is limited. The housing variation and housing market are in grid lock. One way to open up space is to transform buildings into housing units. All kinds of buildings can be transformed - old houses, empty office blocks, old schools, disused farms, factories and warehouses provide many chances to make interesting apartments. As the renovation architect I have experience in all sorts of building transformations. The regulations can be complex but with good communication the conversion of a building can be achieved with a building permit. Each successful renovation requires good preparation. King Architecten is an innovative design office with experience in building and project management. All building regulations for fire escapes, EPN, ventilation, etc. and the required permits can be applied for by the office.